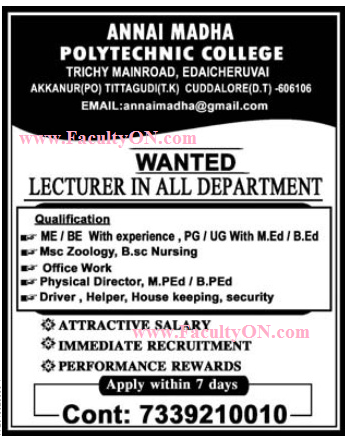 Annai Madha Polytechnic College, Cuddalore has advertised in the DINAMALAR newspaper for recruitment of Lecturers Plus Non-Faculty jobs vacancies. Interested and eligible job aspirants are requested to apply within 07 days from 10th April 2018. Check out further more details below. Note: In advt, it is mentioned that vacancies in all departments. It is not given as particular department. we have given here the list possible departments that offered by the college and based on previous recruitment. You are requested verify it through college about the departments for which the vacancies exists. FacultyON.com is not responsible for this.